Name: Electrothermal Blowing Dry Box. This equipment is widely used for drying, curing, melting and heating in experiments of industrial enterprises, scientific research institutions, and health and medicine units etc. 1.Electrothermal Blowing Dry Box is made of high quality steel plate with electrostatic spray. 2.The inner tank is made of mirror polished stainless steel. Multi-layer carrier bracket with adjustable height. 3. Hot air circulation system inside cabinet. 4. Insulating layer is filled with ultra-fine glass wool. 5. Double-layer toughened glass window to supervise the testing procedure. 6. Silicon rubber sealing ring , to insure the door is highly sealed. 7. Electrothermal Blowing Dry Box equips with thermal protection device, alarm system and timer, which assures the high accuracy temperature control. 1. The inner tank is made of argon arc welding mirror stainless steel. The outer cabinet is made of high quality steel plate, beautiful and original. 2. The cabinet uses microprocessor P.I.D temperature controller with over-temperature protection and Digital display, which also have timer function. 3. Hot-air circulation system consists of continuous moving fan under high temperature and Suitable air duct, which can improve the temperature uniformity. Looking for ideal Blowing Dry Chamber Manufacturer & supplier ? We have a wide selection at great prices to help you get creative. All the Heating Dry Chamber are quality guaranteed. 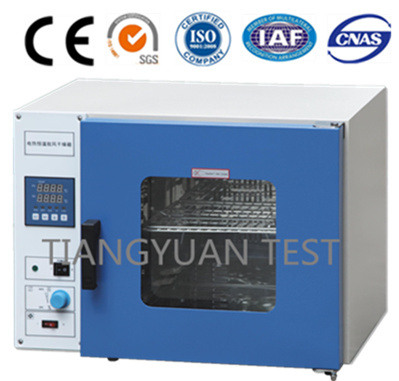 We are China Origin Factory of Electrothermal Drying Chamber. If you have any question, please feel free to contact us.